“This report, by the new economics foundation, sketches out how, in the light of the challenges we face both nationally and globally – consuming beyond our planetary limits, untenable inequality, growing economic instability, and a breakdown in the relationship between ‘more’ and ‘better – things could ‘turn out right’ by 2050 through the process of a ‘Great Transition’. Initially presenting the case for change, the report goes on to discuss some of the steps required for such a transition, including a Great Revaluing, Redistribution, Rebalancing, Localisation, Reskilling, Economic Irrigation, and Great Interdependence. And the built environment features throughout the report in respect of how we recovered our lack of traditional skills, succeeded in addressing the localism issue and turned energy ineffective buildings into models of zero carbon. This entry was posted in comment on January 26, 2011 by martin brown. Hi Fairsnape. Thanks for this post and the link to the report. 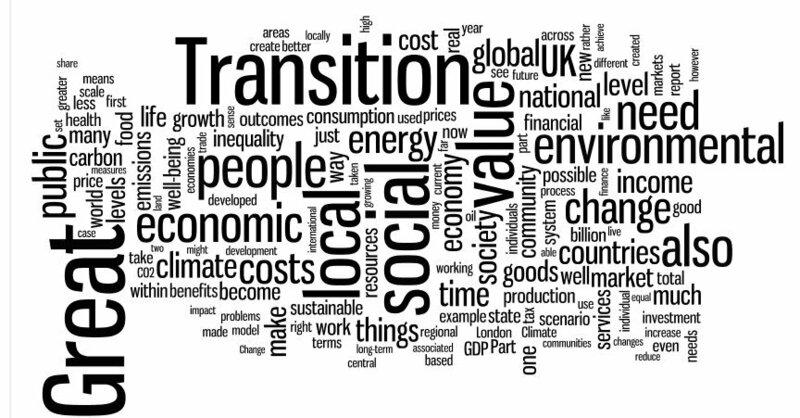 I’m working on a project called Great Transition Stories (http://www.greattransitionstories.org) and we’d like to use the tag cloud graphic that’s included in this post. What’s the rights status of the graphic? Is it Creative Commons and/or could we get permission to use it? Thank you!